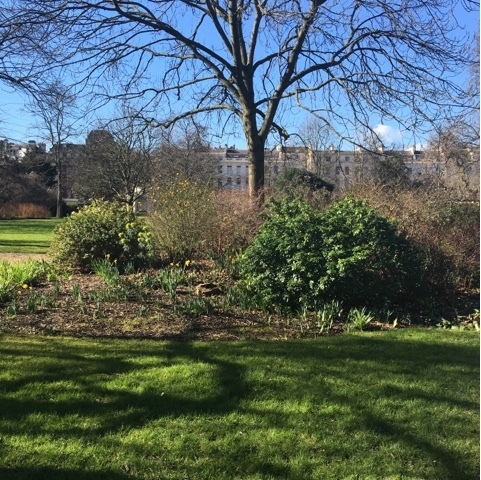 It was a sunny day in March that Kevin Powell, the Head Gardener of Park Crescent and Park Square Gardens, let me into his secret gardens, which border Regents Park. The skies were blue but March winds bit into your face and you longed for some warm soil under your feet. 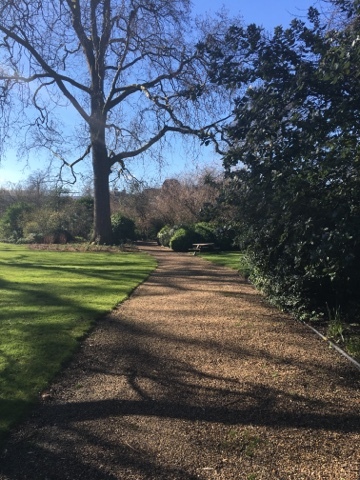 This is a garden where trees take pride of place within a layout designed by John Nash. The famous, semicircular, Nash terrace of houses borders the south of the gardens on the other side from Regent's Park and it was for the residents of the terrace and nearby houses, that the gardens were originally created. 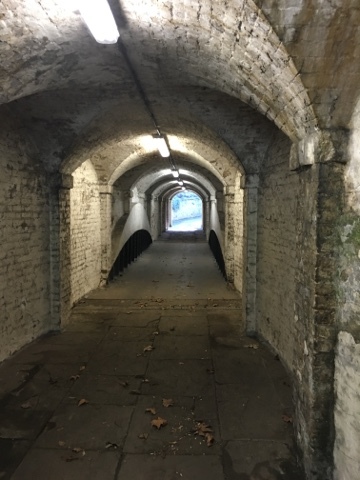 Unique to these gardens is a connecting tunnel, called the Nusemaids' Tunnel, which burrows under the busy Marylebone Road. Nursemaids from the houses did indeed steer their prams down the gentle slopes to the tunnel. The tunnel is so designed and its approaches accordingly planted, that from ground level, looking across the gardens, it is cleverly concealed so that you wouldn't know it existed. But it is a very beautiful tunnel. So lovely and, more to the point, so centrally located that it attracted the attentions of the board of the Metropolitan Line, who tried to demolish it. They were stopped by the matter being taken to Parliament, and a further underground tunnel had to be dug under the Nursemaid's tunnel for the railway. 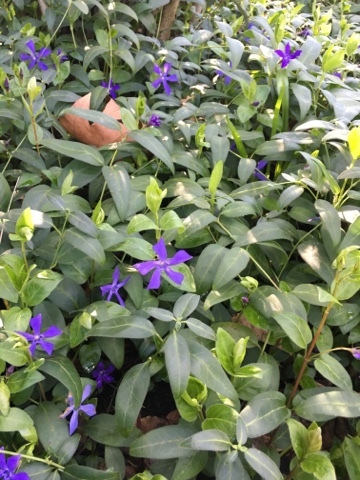 The banks on one side of the tunnel approach were covered with an unusual periwinkle with curved petals. 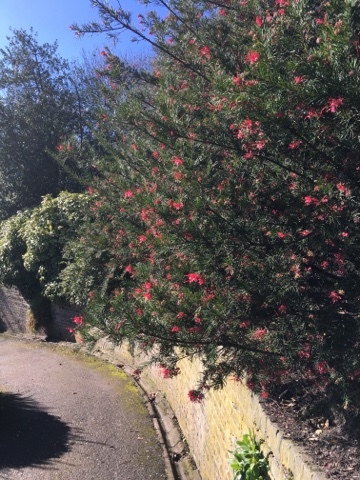 There will be lots of inspiring plant borders to view as you wander along ancient brick-lined paths laid out just as they were planned in 1817. Some have acanthus at the back bordered by catmint at the front, others have agapanthus, globe thistles, echinops, fennel, bee balm, and achillea, to name but a few. And the simple formality of several small rose beds, all immaculately pruned, should also be glorious in June. 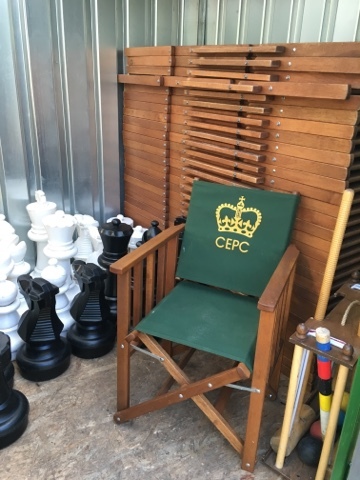 Behind the scenes, in one of the sheds, I also got a glimpse of what the residents might get up to in the summer months on the secret lawns - a spot of croquet or chess, anyone? 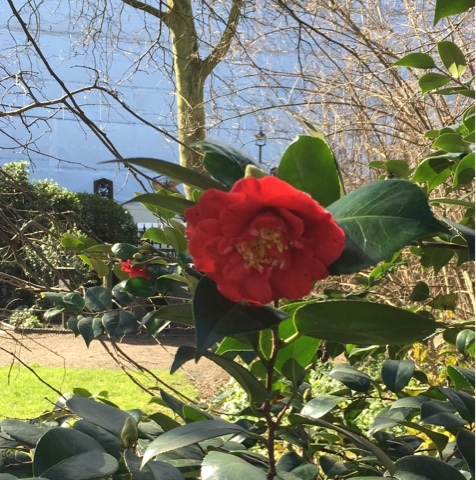 At this time of year camellias were starting to bloom and there were several to admire like this one as well as daphnes and other winter-scented plants. Kevin and his team of nine gardeners look after all the mature trees, including a beautiful Tulip tree, and try to maintain the traditional lay out of the space. They are conscious of the historic urban environment in which the park sits, with the BT Tower popping up from one viewpoint, and the Nash Terrace from another. Along many of the restored iron railings, the hedges have been replanted to give space to each individual shrub and a degree of flow and informality, creating an evergreen screen, rather than formal, clipped hedging, to preserve the privacy of the gardens. Around each tree the gardeners have cleared the grass and put down a wood mulch, a technique which benefits the trees and also creates interest across the lawns. Some of these 'tree circles' have been planted with crocuses and it was here that I spotted my first bee of the year. 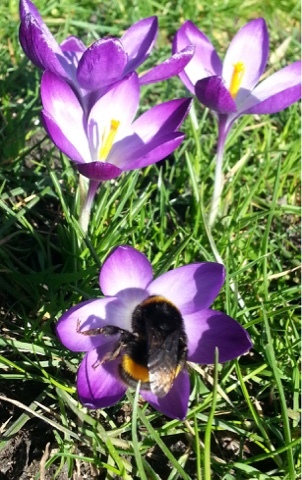 As I bent down to look at the bee, one of the gardeners was passing and he remarked that the crocuses had come into bloom that morning. 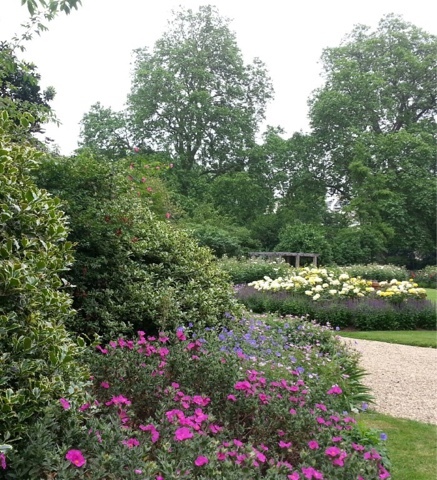 He and the whole team take a sincere interest in their work and really value opening the gardens for Open Garden Squares Weekend, as this is the one time a year when they can showcase the fruits of their labour to the wider public. Go along this June, enjoy what you see, and give the gardeners a bit of well-deserved praise. As Marcel Proust said - " Let us be grateful to people who make us happy; they are the charming gardeners who make our souls blossom."